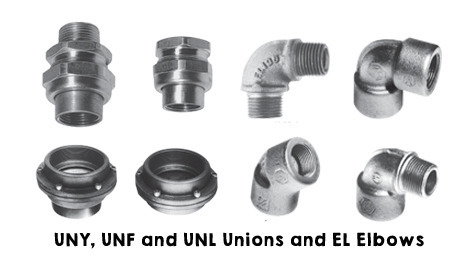 UNA unions are used in conduit and fitting installations when entrance angle is between 90° and 180°. Permit conduit joints at angles between 90° and 180° EL elbows have a smooth interior and are both strong and compact. Download the UNY, UNF and UNL Unions and EL Elbows spec sheet below or call 714.835.6211 for more information.